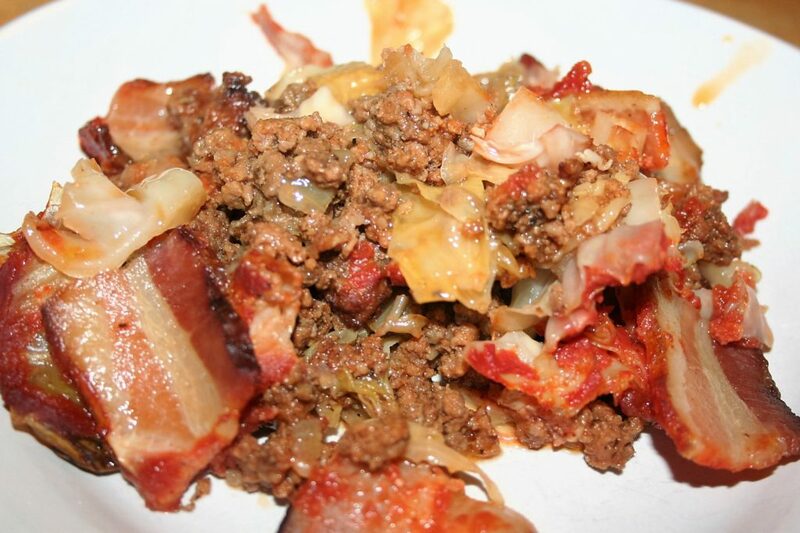 Slow-cooked cabbage with ground meat, bacon, and a touch of tomato sauce. This is another of those recipes I got back when I was either on Atkin’s or on the hCG diet. I got it from http://genaw.com/lowcarb/index.html. She has tons of low carb recipes over there. I like a lot of them. The green been and hamburger casserole is a favorite here. As some of you may recall, Michael is allergic to beef and pork, so I have to change this up a bit for him. However, this is one of those recipes that I’m unwilling to change for myself and the kids. (Yeah, they’re not really “kids” any more but what do you call young adults that still live with you?) So, I change it up a bit for Michael and make it with the beef and bacon for the kids and me. 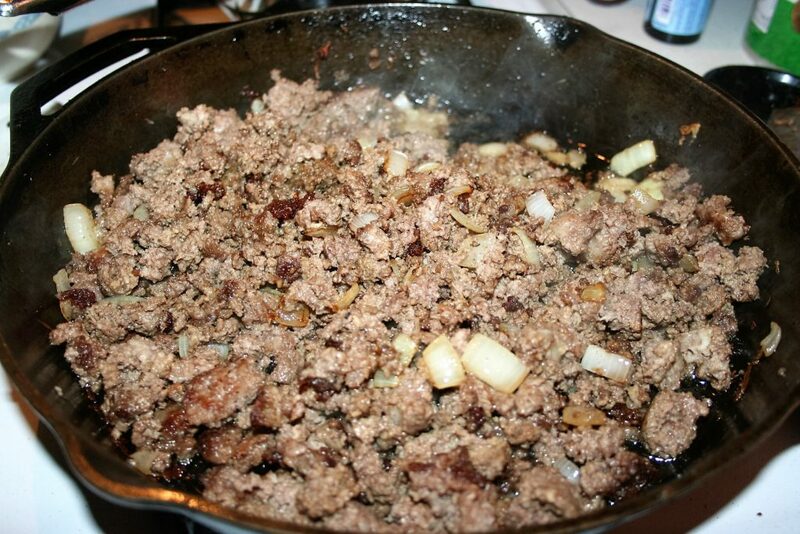 Start by browning your ground beef with the chopped onion and some salt and pepper. Spray your 9×13 casserole dish. 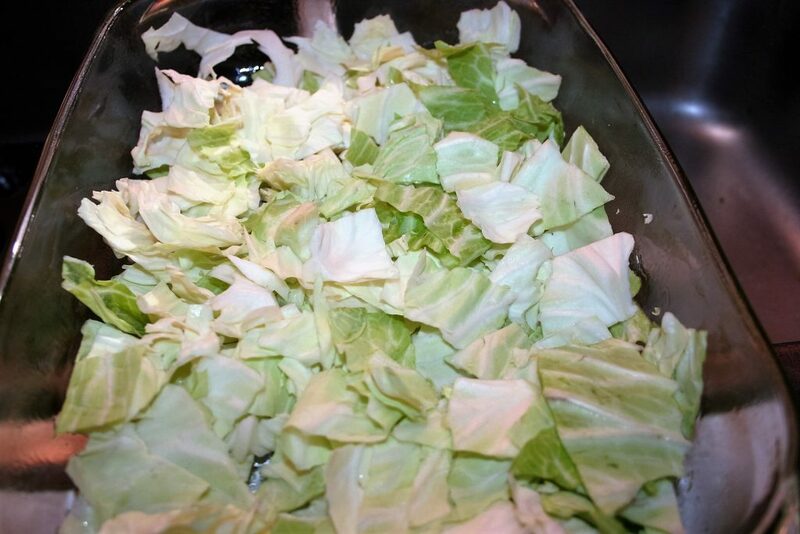 Place half of the cabbage on the bottom of your pan and season with salt and pepper. Next place the browned ground meat (and onions) over the cabbage. Next add the rest of the cabbage with more salt and pepper. Spoon about 2 cups of tomato sauce on top of the cabbage. Then add bacon. 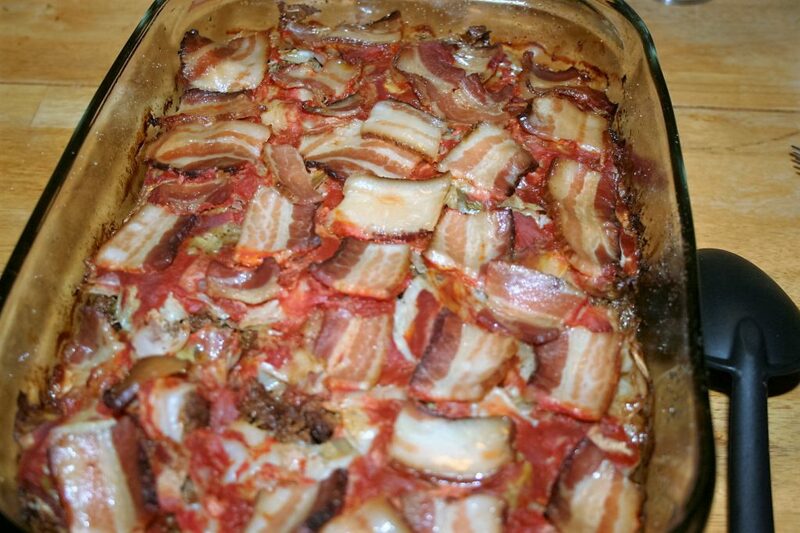 The original directions say to place 3 pieces of bacon across the top. I happened to have these bacon pieces so I laid them out evenly over the top. As you can see, I put a bit more than 3 whole pieces but I like the bacon. Cover with foil and bake at 350º for 3 hours. NOW I MUST SAY that I used a glass pan, so I reduced the temperature down to 325º. I also like my bacon a little crispy because I’m going to eat that yummy stuff rather than discard it like the original directions state. Consequently, I removed the foil for the last 30-60 minutes of baking. I have a gas oven so broiling things is a real pain but if I had an electric oven, I’d just broil it to crisp up the bacon. When I do this with ground turkey and turkey bacon, I add a little coconut oil (or olive oil) because these meats are way too lean. Brown the beef with the onions, salt, and pepper. 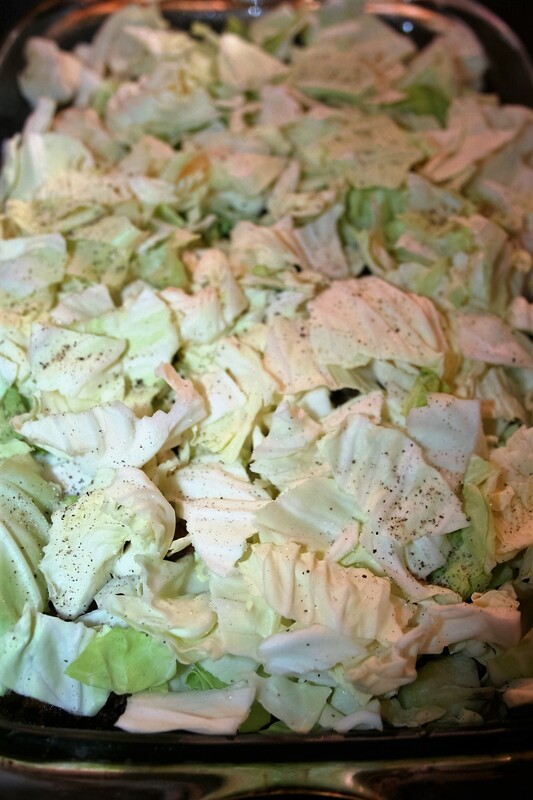 Place half the cabbage in the pan.Season with salt and pepper. 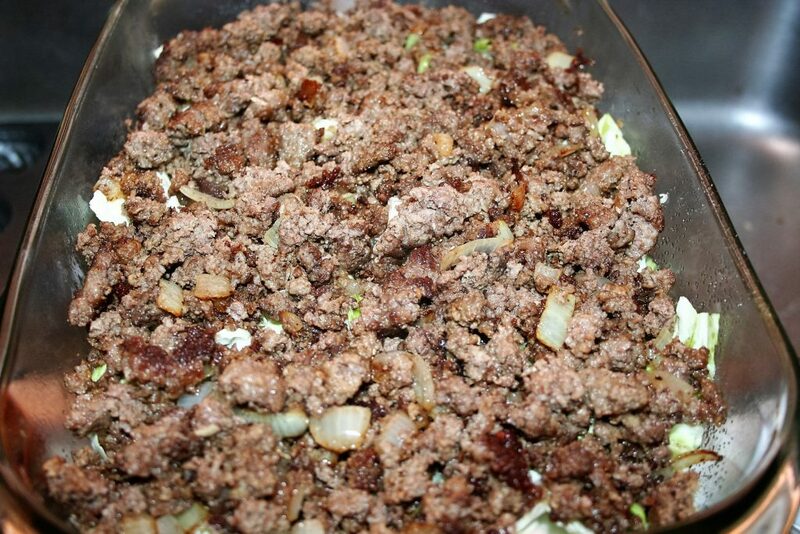 Spread cooked beef and onions over the cabbage. 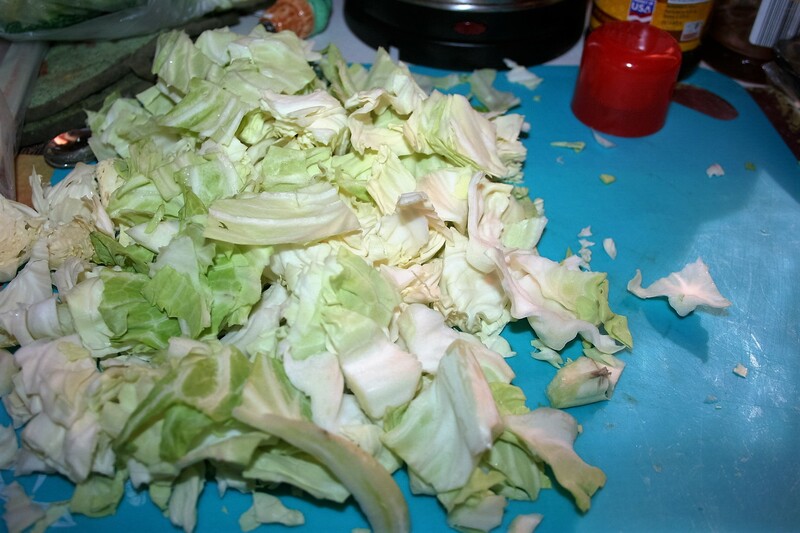 Spread remaining cabbage atop the beef. Season with salt and pepper. Spoon tomato sauce atop the cabbage. 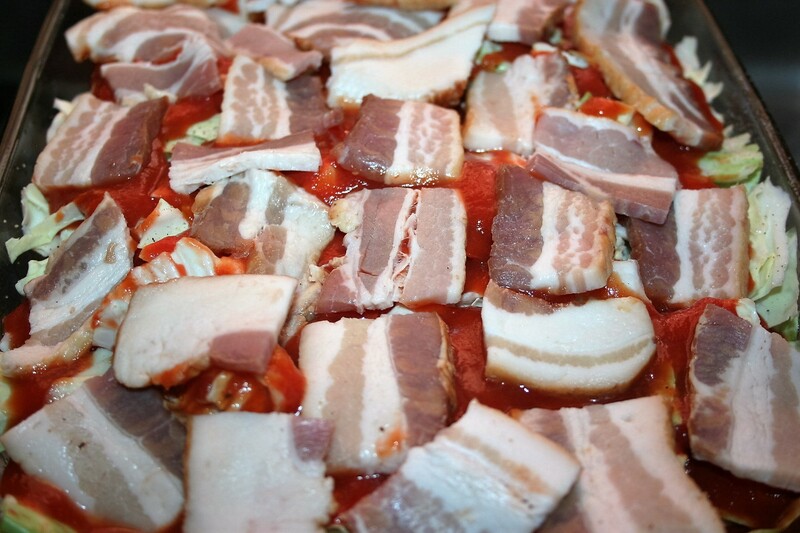 Place bacon on top of the tomato sauce.